Tourism is the nation's third largest retail sales industry, and the country's largest employer, supporting 7 million jobs. Today, more and more travelers are visiting historic districts where they experience the stories and people of the past. Cities and towns across the country have discovered how well the preservation of historic, cultural, and natural resources combines with tourism to sustain local economies. It creates jobs and provides new business opportunities. It also helps to protect natural resources and improve the quality of life for residents. Improvements are being made in the Great Falls / S.U.M. National Historic Landmark District to increase its share of this business. $4.147 Million in federal funding has been allocated through the New Jersey Urban History Initiative (UHI) to conduct historic preservation programs that encourage economic development. Some of the projects include repairs and stabilization to bridges, the upper raceway and the ATP Site. The National Park Service has stated that the "ATP Site as a whole, and the Colt Gun Mill in particular, continue to contribute to the significance of the Great Falls / S.U.M. Historic District, despite the destruction and/or loss of integrity of the individual structures on the site." $1.67 Million of the UHI funding will continue the important process of identifying the historic resources on the site, stabilizing the ruins, and developing treatment options for the ATP Site. These funds will also be used for hazardous materials remediation and "development of historic and public site elements." These development elements are listed as "pavement, Belgian block curbs, walkways, demolition/ earthwork/ grading/ site preparations/ subgrade rubble, historic foundations and walls/use with new construction, landscaping, Waverly Mill Stabilization, smoke stack/plaza, river walk rehabilitation, historic river walk, Colt Mill Plaza, refurbish Middle Race and Colt Mill Stabilization." The New Jersey Historic Trust has granted the City of Paterson a $359,000 state matching grant through the New Jersey Preservation Bond Fund for the stabilization of the Colt Gun Mill. The first phase of the stabilization has been completed. Portions of the mill's walls have been removed and stored. Temporary bracing has been erected. The second phase involves abatement of hazardous materials and removal of debris from the interior of the mill. Significant architectural elements will be salvaged and stored for future study. The City of Paterson was also awarded a $500,000 matching grant from the State of New Jersey Department of Environmental Protection's "Green Acres Program" for the stabilization of the riverwall and construction of a river walk. Due to a homicide on the ATP Site in July, the City of Paterson issued a Declaration of Emergency for the site. The City erected more fencing to better secure the site and cleared away trash, brush and trees. The city is also in the process of contracting the Louis Berger Group, Inc. to demolish one non-contributing historic structure and stabilize and secure two remaining structures that were used as housing by the homeless. The strength of New Jersey's tourism industry depends in large part upon New Jersey's unique and beautiful natural and historic resources. In urban settings, parks are important to the quality of life for city neighborhoods. The S.U.M., the Colt guns, the locomotives, the Holland submarines, the cotton and silk industries, and the early labor movement, to name a few, were very important contributions to America's heritage. 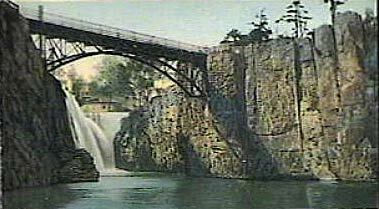 The historic mills and raceways, the beautiful Great Falls and Passaic River are great treasures. The ATP Site's open space along the river offers a rare chance to enhance the waterpower district with pedestrian-friendly areas. The site can come alive for tourists and fit into the community by having paths, gardens, and open fields. Bringing the public into the district will really bring it back to life. In addition, the surrounding neighborhoods deserve access along the river where children and adults can go for exercise and sunshine. All across America, cities are creating parks as focal points for economic development and neighborhood renewal. The recent blocking of the prefabricated townhouses on the ATP Site now gives us a renewed opportunity to realize the full potential of the waterpower district.